Long the signature case form of Bell & Ross, the square BR 01 was inspired by aircraft instruments but has long since evolved into a diversity of timepieces, including the brand’s flagship watches in clear, sapphire crystal cases. 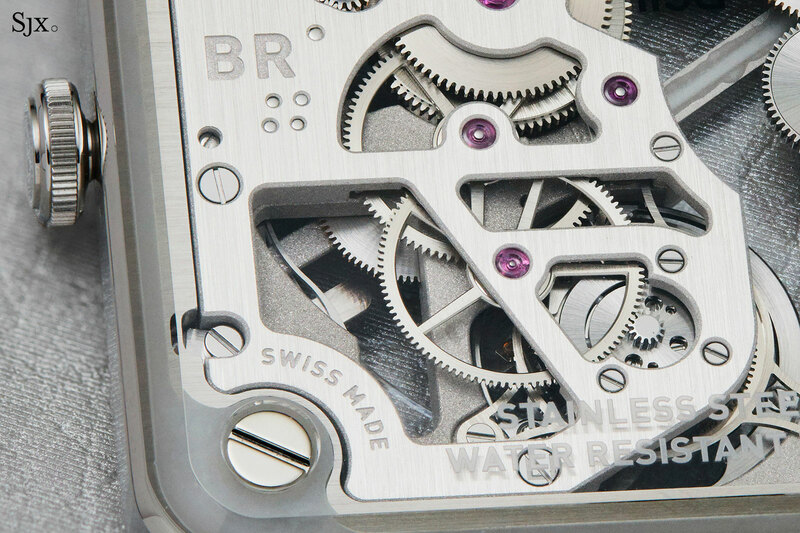 The latest, and arguably the most elegantly conceived, is the BR-X2 Skeleton Tourbillon Micro-Rotor. Bell & Ross first debuted a sapphire watch case in 2016 with the BR-X1 Chronograph Tourbillon Sapphire, which was not unlike most other sapphire case watches – impressively large, yet transparent. 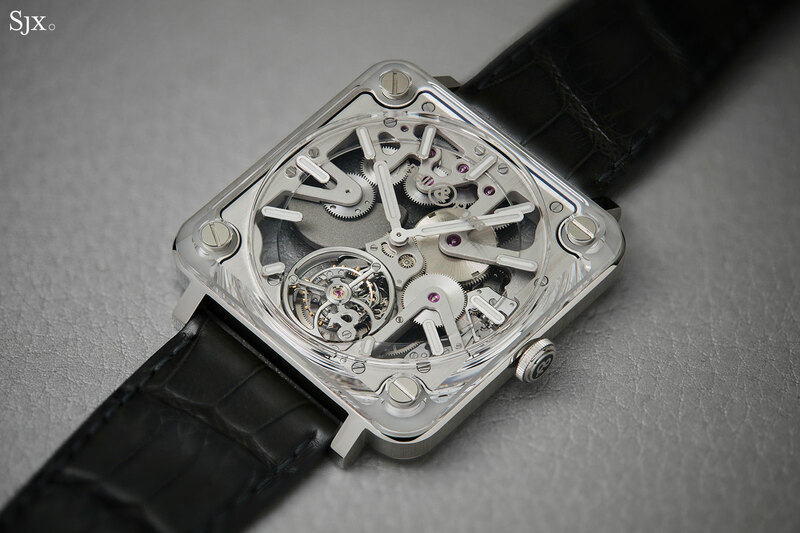 That was followed by the equally chunky BR-X1 Skeleton Tourbillon Sapphire. Last year Bell & Ross took a different tack, streamlining and slimming the case, while also reinventing its construction. 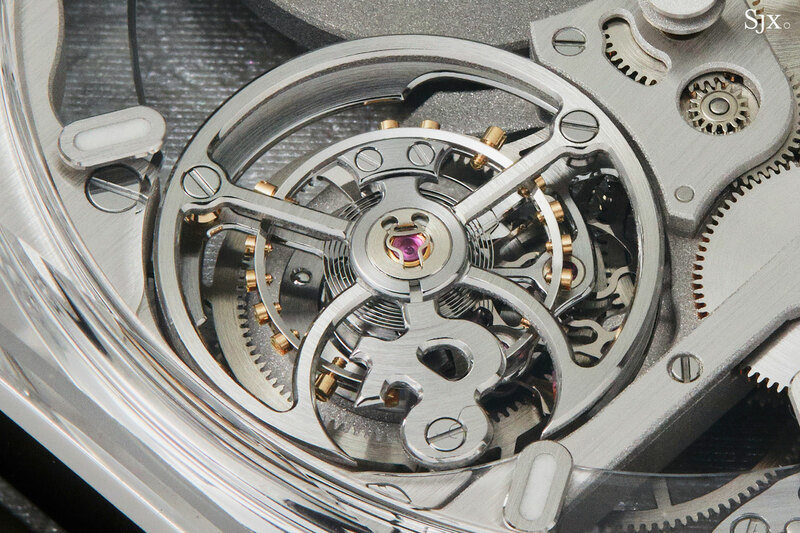 The BR-X2 was essentially a movement sandwiched between two sapphire plates, front and back. 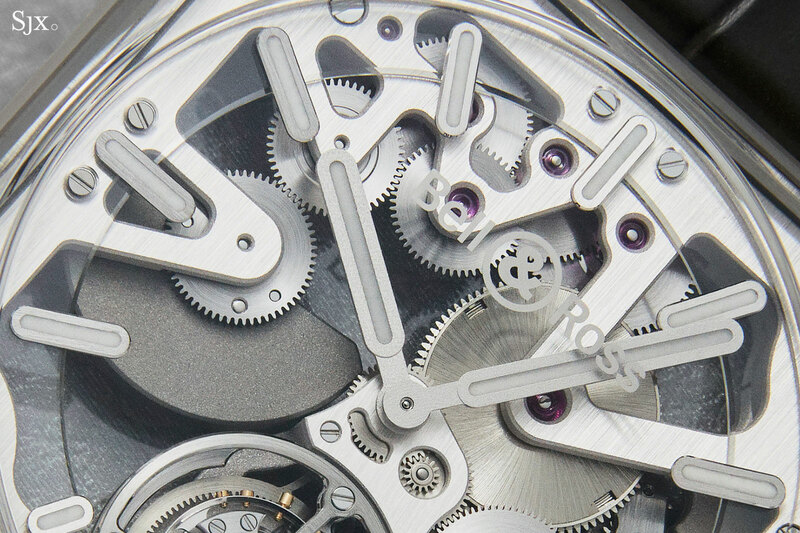 The new BR-X2 Skeleton ratchets up the transparency by stripping out the movement, which has a construction that lends itself particularly well to open-working. Conceived as a movement with barely a watch case, the calibre sits inside a narrow stainless steel frame – the movement and case are essentially one and the same. Two sapphire crystal plates act as the bezel and case back, sandwiching the movement between, creating a construction that has both strength and transparency. Impressively, the case is only 8.9mm high, with the two sapphire panels accounting for more than half its thickness. 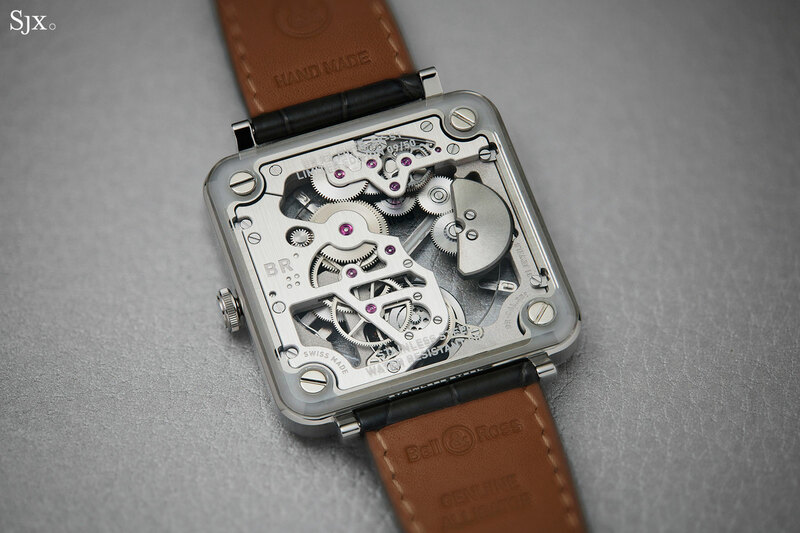 The movement alone is a mere 4.05mm high. Seen from the side, the case is a just narrow band of metal. In fact, the case is slim enough that it is finished with a vertical brushing, which accentuates its height, instead of the usually lateral brushed finish that makes a case seem longer rather than higher. Combined with the 42.5mm diameter and short lugs, the result is an elegantly proportioned case, an unusual feat for a large form watch. With polished, sloping edges, the sapphire crystals offer a sweeping view of the movement from all perspectives, despite their thickness. 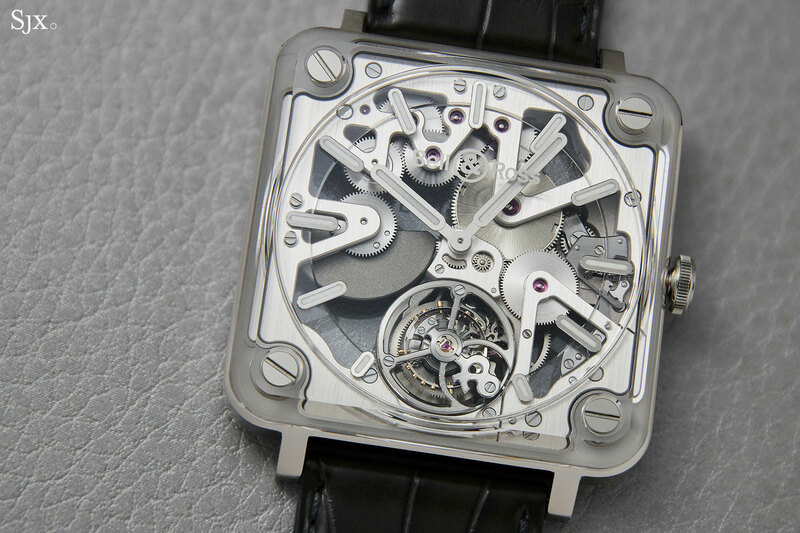 Visually, the movement extends right to the edge of the case, framed by the four screws that keep the sapphire crystals in place. And because the case is sealed with clear gaskets, the look is seamless, while also being water-resistant to a surprising 50m. 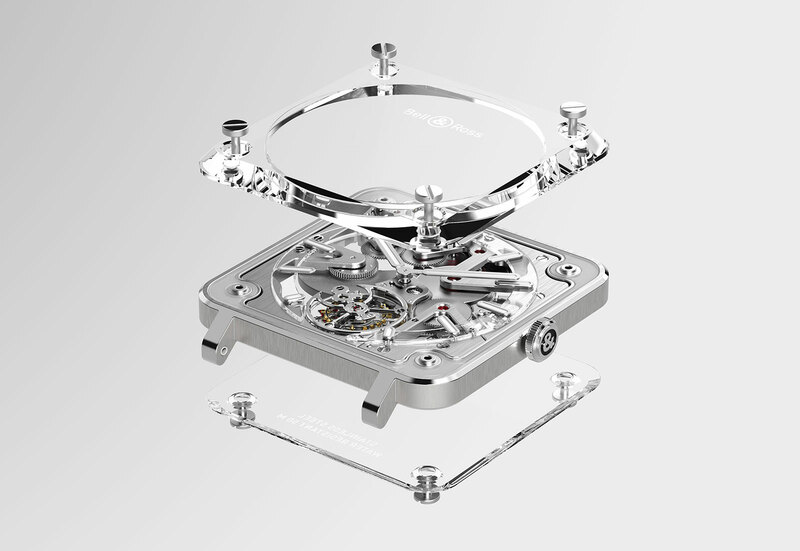 The approach to the case is also a practical one: it eliminates the need to machine the whole case in sapphire, a lengthy and costly process that usually makes the case the most expensive component in an all-sapphire watch. Consequently, the BR-X2 is almost a fifth the price of the BR-X1 of 2017, which had a nine-part sapphire crystal case. 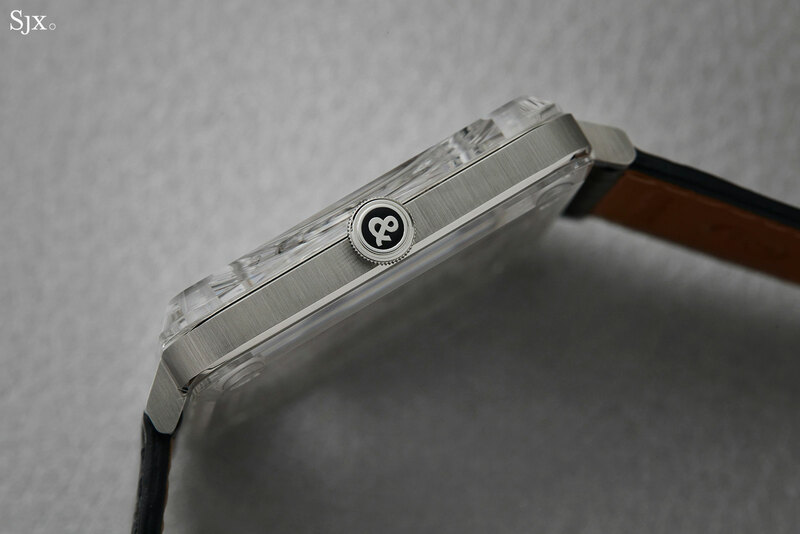 However, the key feature of the watch is the self-winding movement. 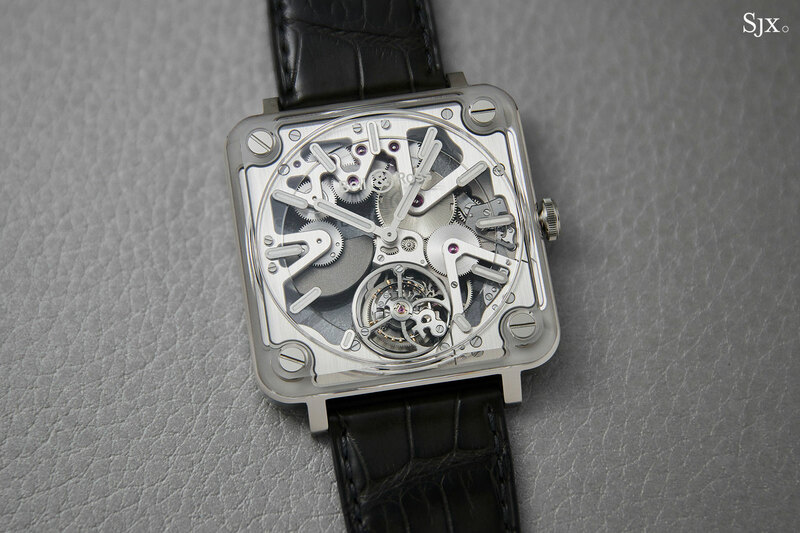 As with most of the complicated movements used by Bell & Ross, the BR-CAL.381 was developed by Manufacture Hautes Complications (MHC), a Geneva-based complications specialist founded by Pierre Favre, a watchmaker who was formerly at complications specialist BNB Concept, which was folded into Hublot after it went bust. While mechanically identical to the movement in last year’s BR-X2, the bridges and base plate here are open-worked, giving it a dramatically different look. While the flying tourbillon regulator was the visual focus in the original BR-X2, especially combined with its large bridges, the negative space within the skeleton movement draws the eye away, compelling one to take in the movement as a whole and then its details. 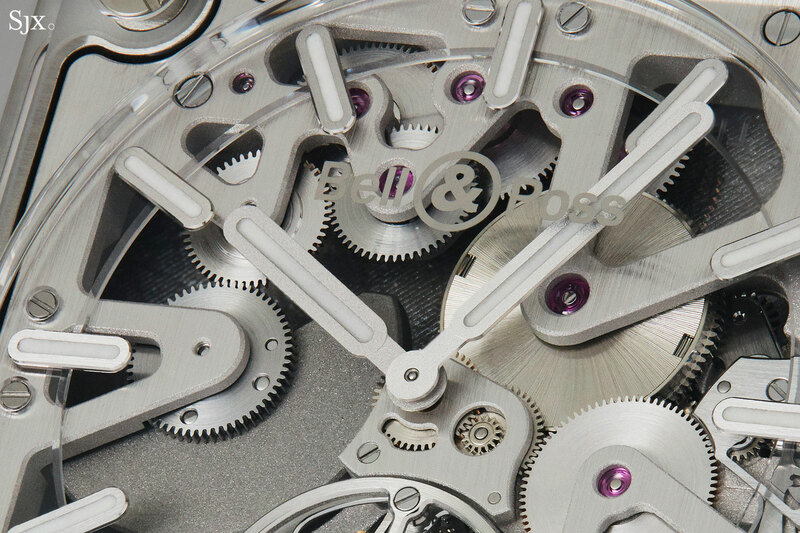 The open-working reveals the entire workings of the calibre, starting from the micro-rotor at nine o’clock, which is wound by the gearing at 12 o’clock. The mainspring sits at one o’clock, driving the wheel train that extends downwards to the tourbillon at six. Despite the compact barrel, the movement still manages a respectable 50-hour power reserve. The skeletonisation of the calibre has been done in a clean, architectural style that emphasises the round forms of the wheels as well as the layout of the wheel train and winding mechanism. 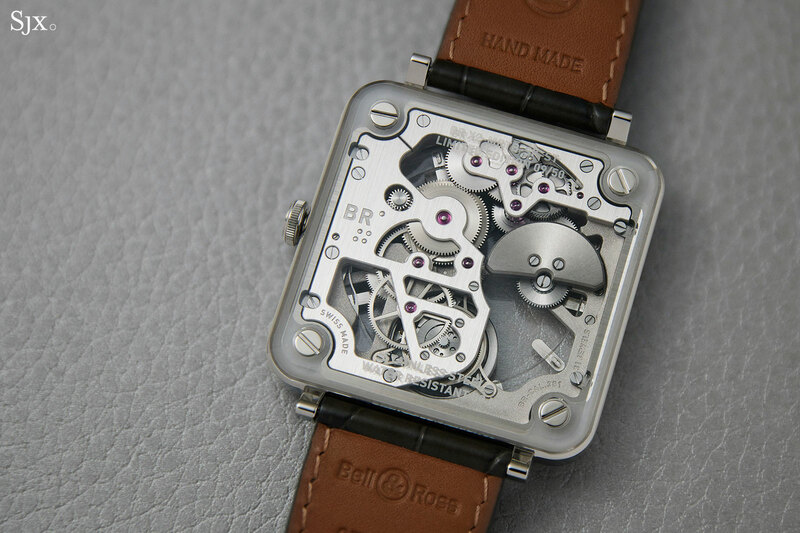 Finished simply, the movement is aesthetically congruent with Bell & Ross’ house style. The finish is monochromatic, with most parts being steel or rhodium-plated, but the surface finishes are carefully varied. While the wheels are circular grained, the front of the bridges and base plate are vertically brushed, while their bevels, flanks and backs are finished with a granular frosting. Similarly, the tungsten alloy rotor is finished with a spiral graining on top, and a coarser frosting on its other faces. 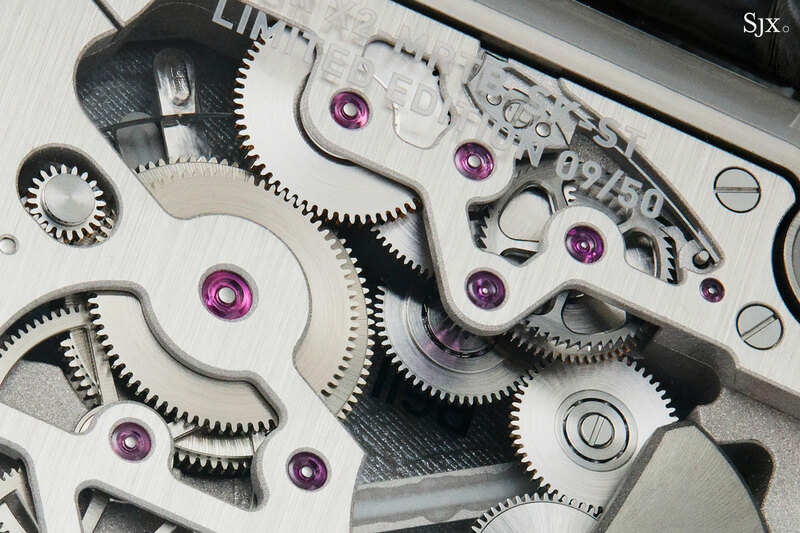 Although the movement appears almost industrial, its details are surprising fine. And because most major parts are visible from the front and back, both sides of each component have to be finished. The slots of most screws are bevelled, while the jewels sit in frosted countersinks. The spokes and inner edges of most wheels are also bevelled. 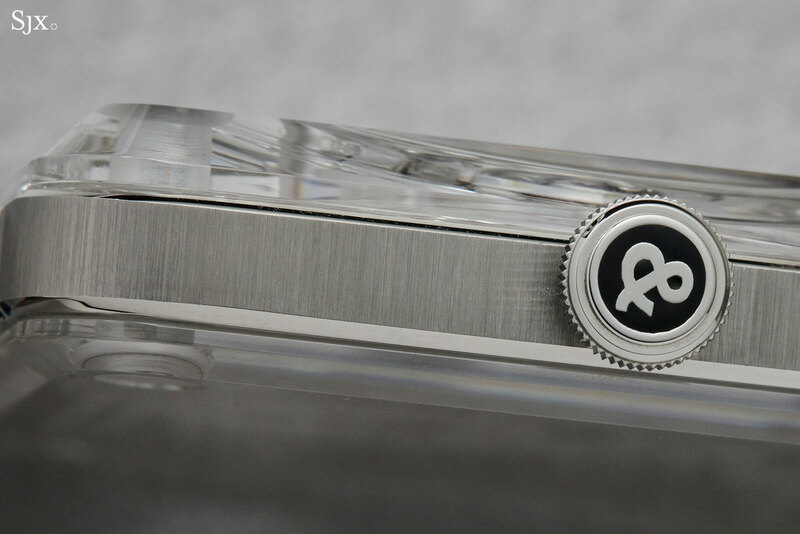 Shaped like the ampersand of Bell & Ross’ logo, the tourbillon cage, however, is finished to a slightly higher degree. While it has a circular brushed top surface, its edges are bevelled and polished. The balance wheel features gold adjusting screws, a feature found on most of MHC’s calibre. With the intricacies of the movement, the dial is barely there. It’s a circular flange, made of clear sapphire naturally, featuring applied luminous indices that float above the movement, adding another pleasing dimension to the dial. For maximum legibility, or as much legibility as a heavily skeletonised watch can offer, the hands are filled with Super-Luminova and frosted, which means they catch the light different from the brushed surfaces of the movement. 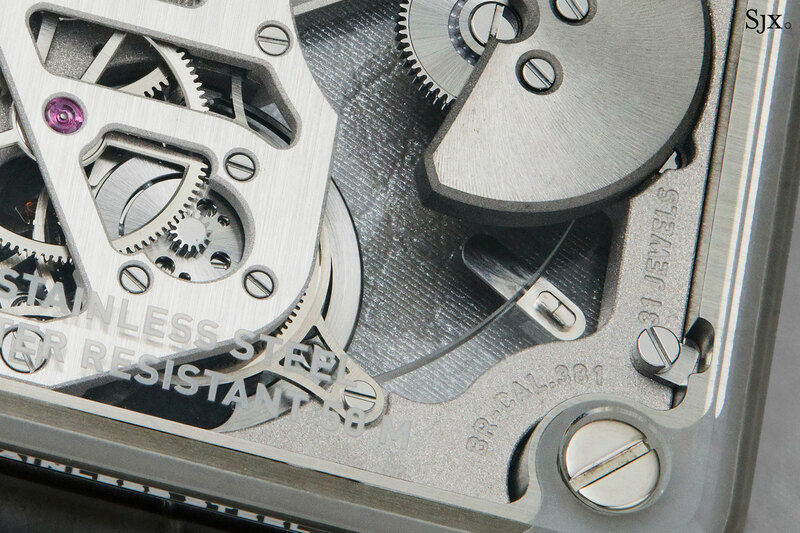 While it is clear that aesthetics and mechanics are what motivated the styling of the BR-X2 skeleton – departing from the typical, no-nonsnse aviation instrument look of Bell & Ross – it is still fairly legible as such things go. Limited to 50 watches, the Bell & Ross BR-X2 Skeleton Tourbillon Micro-Rotor (ref. BRX2-MRTB-SK-ST) is priced at US$79,000 or S$115,000. For more on the BR-X2, visit bellross.com.